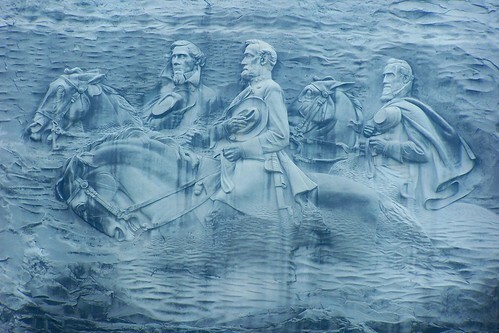 This bas relief sculpture depicts the three main Confederate leaders of the American Civil War - namely President Jefferson Davis and General Robert E. Lee and Thomas J. "Stonewall" Jackson and their favourite horses, "Blackjack", "Traveller", and "Old Sorrel", respectively). The entire carved surface measures 3 acres (12,000 m2), about the size of three football fields. 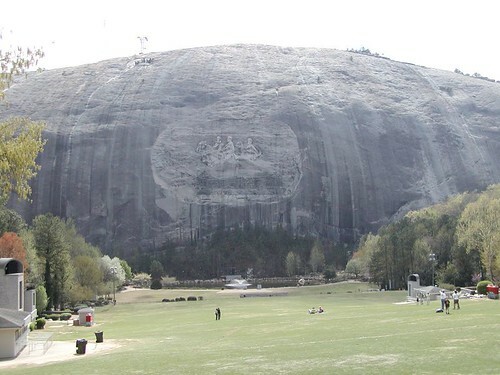 The carving of the three men towers 400 feet (120 metres) above the ground, measures 90 by 190 feet (58 metres), and is recessed 42 feet (13 metres) into the mountain. It is even bigger than the better known four heads at Mt. Rushmore, on South Dakota, which incidentally are carved statues and not exactly bas-relief work. The work is brain child of late Mrs. C. Helen Plane, charter member of the United Daughters of the Confederacy (UDC). It was started in 1916 by Gutzon Borglum who left the work midway in 1923, (and later took up and completed the famous Mt. Rushmore faces). The work on Confederate Memorial was however continued by Augustus Lukeman until 1928 but he could not finish it, and it remained unfinished for more then 3 decades. 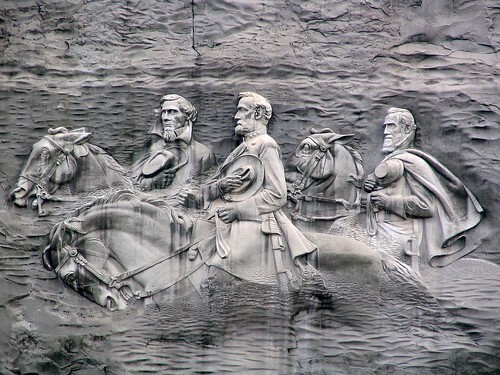 The carving was completed by Roy Faulkner and officially declared open on March 3, 1972. 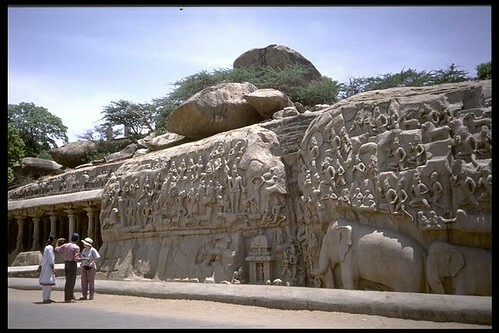 Although remarkable in size, quite a lot of work of stone cutting and engraving was carried out by modern tools including a newly developed technique of utilizing thermo-jet torches. 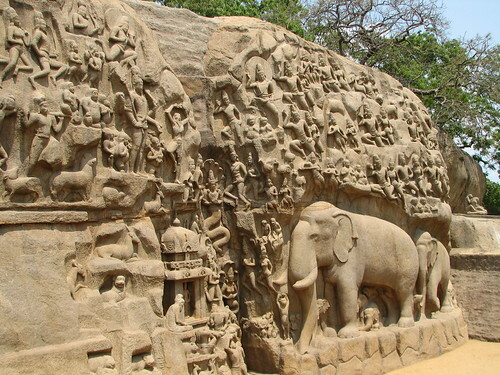 In contrast the huge bas-relief work at Mahabalipuram, India was created in 7th century by mere use of hammer and chisel. 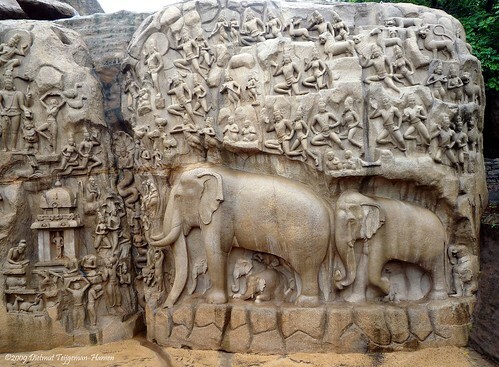 Mahabalipuram, a 7th century port city around 60 km south from the city of Chennai in Tamil Nadu has many historic rock-cut and monolithic monuments built between 7th - 9th century AD. Most famous of these rock cut works is a massive bas-relief rock dating from the 7th century CE measuring 96 feet long by 43 feet high. It is an awe-inspiring marvelous piece of finely crafted stone and one can gaze it in wonder admiring the fine craftsmanship and time and effort which must have gone in building it. There is no agreement between the various archaeologists/historian regarding the stories depicted in the mural. It therefore known by two names - "Descent of Ganga (Ganges)" as well as "Arjuna's Penance". Incidentally the unusually balanced rock 'Krishna's Butterball', about which I made a post some time ago, is located very close to this fantastically huge piece of art.